Since 09.2016: Heisenberg Fellow of Experimental Condensed-matter Physics, Physikalisches Institut, Karlsruhe Institute of Technology, Karlsruhe, Germany. Head of the Heisenberg Spin-dynamics Group. 10.2008 – 09.2016: Principle investigator, Max-Planck-Institut für Mikrostrukturphysik, Halle, Germany. Senior Scientist and Head of the Spin-dynamics Group (Spin Polarized Electron Energy Loss Spectroscopy laboratory), Experimental Department of Prof. J. Kirschner. 01.2008 – 10.2008: Postdoctoral research associate, Max-Planck-Institut für Mikrostrukturphysik, Halle, Germany, Experimental Department of Prof. J. Kirschner. 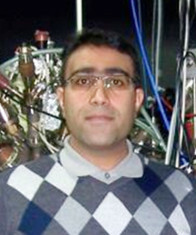 06.2007 – 01.2008: Postdoctoral research associate, Department of Physics and center for Nanointegration, Universität Duisburg-Essen, Duisburg, Germany, Group of Prof. M. Farle. H. J. Qin, Kh. Zakeri, A. Ernst and J. Kirschner. • Highlighted by Physics Focus Story. • Highlighted by Physics World. • Highlighted by American Physical Society.